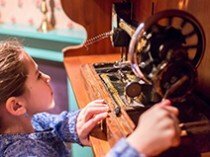 Don't miss these fun family-friendly objects and interactives during your visit. Immerse yourself in our interactive Shabbat table experience. Serve some challah bread and pretend to light the Shabbat candles. Experience a Jewish home in the East End of London. Can you smell the chicken soup and plait the challah bread? Handle the tools in the tailor’s workshop and learn more about this popular profession. Take part in colouring and puzzle activities while enjoying the delicious food and drink in our family-friendly café.